Çalışmanın amacı yerel stratejik yönetim literatürüne en fazla etkide bulunan Türk yazarların ortaya çıkarılmasıdır. Bu doğrultuda Google Scholar bibliyografik veri tabanından 12.02.2017 tarihine kadar stratejik yönetim alanında yayınlanan ve indekslenen 9.475 akademik çalışma ve bu çalışmalar arası atıf ilişkileri Java temelli Selenium Kütüphanesi yardımıyla geliştirilen bir yazılım ile toplanmıştır. Çalışmalar arasındaki atıflar yazar atıf ilişkilerine dönüştürülerek ağ analizi ile değerlendirilmiştir. Elde edilen bulgulara göre bu alanı temelde 4 yazarın etkilediği görülmektedir. Bununla birlikte bulgular Türk yazarların birbirlerine atıf yapma eğiliminin çok düşük olduğunu göstermektedir. Bu durum bir literatürün gelişmesi için kritik önemde olan yazarlar arası sinerjinin düşük düzeyde olduğu şeklinde yorumlanabilir niteliktedir. Acedo, F. J., Barroso, C., Casanueva, C. ve Galán, J. L. (2006) "Co-authorship in Management and Organizational Studies: An Empirical and Network Analysis", Journal of Management Studies, 43(5), ss. 957-983. Akdeve, E. ve Köseoğlu, M. A. (2013) "Türkiye’de Stratejik Yönetimin Akademik Örüntüsü Nasıl Gelişiyor? Lisansüstü Çalışmalar Üzerine Bir Araştırma", Finans Politik & Ekonomik Yorumlar, 50(581), ss. 63-74. Atan, S. ve Emekci, H., (2018) İktisat ve İşletme Uygulamaları için R ile Veri Analizi: İstatistik-Modelleme-Uygulama. Ankara: Seçkin Yayıncılık. Barca, M. ve Hızıroğlu, M. (2009) "2000’li Yıllarda Türkiye’de Stratejik Yönetim Alanının Entellektüel Yapısı", Eskişehir Osmangazi Üniversitesi İİBF Dergisi, 4(1), ss. 113-148. Barnett, G. A., Huh, C., Kim, Y. ve Park, H. W. (2011) "Citations among Communication Journals and Other Disciplines: A Network Analysis", Scientometrics, 88, ss. 449-469. Benckendorff, P. ve Zehrer, A. (2013) "A Network Analysis of Tourism Research", Annals of Tourism Research, 43, ss. 121-149. Calma, A. ve Davies, M. (2015) "Studies in Higher Education 1976–2013: A Retrospective Using Citation Network Analysis", Studies in Higher Education, 40(1), ss. 4-21. Cobo, M.J., López-Herrera, A.G., Herrera-Viedma, E. ve Herrera, F. (2011) "Science Mapping Software Tools: Review, Analysis, and Cooperative Study among Tools", Journal of the American Society for Information Science and Technology, 62(7), ss. 1382-1402. Culnan, M. J. (1986) "The Intellectual Development of Management Information Systems, 1972-1982: A Co-citation Analysis", Management Science, 32, ss. 156-172. Çetin, Ç. K. ve Çaylan, D. Ö. (2015) "Stratejik Yönetim Yazınının Entelektüel Yapısında Değişim: 2001-2013 Yılları Arası Bibliyometrik Bir Değerlendirme", Atatürk Üniversitesi İktisadi ve İdari Bilimler Dergisi, 29(1), ss. 101-120.
de Vries, Y. A., Roest, A. M., Franzen, M., Munafò, M. R. ve Bastiaansen, J. A. (2016) "Citation Bias and Selective Focus on Positive Findings in the Literature on the Serotonin Transporter Gene (5-HTTLPR), Life Stress and Depression", Psychological Medicine, 46(14), ss. 2971-2979. Ederington, L. H. (1979) "Aspects of the Production of Significant Financial Research", The Journal of Finance, 34(3), ss. 777-786. Ferreira, J. J., Fernandes, C. I. ve Ratten, V. (2016) "A Co-citation Bibliometric Analysis of Strategic Management Research", Scientometrics, 109(1), ss. 1-32. Freeman, L. C. (1979) "Centrality in Social Networks Conceptual Clarification", Social Networks, 1(3), ss. 215-239. García-Lillo, F., Claver-Cortés, F., Marco-Lajara, B. ve Ubeda-García, M. (2017) "Mapping the Intellectual Structure of Research on 'Born Global' Firms and INVs: A Citation/Co citation Analysis", Management International Review, 57(4), ss. 631-652. Garfield, E. (1979) Citation Indexing - Its Theory and Application in Science, Technology, and Humanities. Philadelphia, PA: ISI Press. Griffin, D. J., Bolkan, S., Holmgren, J. L. ve Tutzauer, F. (2016) "Central Journals and Authors in Communication Using a Publication Network", Scientometrics, 106, ss. 91-104. Güzeller, C. O. ve Çeliker, N. (2018) “Bibliometric Analysis of Tourism Research for the Period 2007-2016”, Advances in Hospitality and Tourism Research (AHTR), 6(1), ss. 1-22. Hanneman, R. A. ve Riddle, M. (2005) Introduction to Social Network Methods. CA: University of California. Haythornthwaite, C. (1996) "Social Network Analysis: An Approach and Technique for the Study of Information Exchange", Library & Information Science Research, 18(4), ss. 323-342. Jo, H., Park, Y., Kim, S. E. ve Lee, H. (2016) "Exploring the Intellectual Structure of Nanoscience and Nanotechnology: Journal Citation Network Analysis", Journal of Nanoparticle Research, 18, ss. 167-188. Karasözen, B., Bayram, Ö. G. ve Zan B. U. 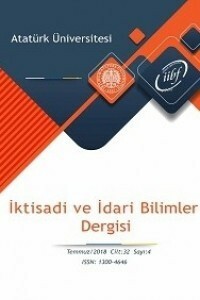 (2009) “1997-2006 Türkiye Bilim Göstergeleri Analizi”, Türk Kütüphaneciliği, 23(1), ss. 4-21. Kessler, M. M. (1963) "Bibliographic Coupling Between Scientific Papers", American Documentation, 14(1), ss. 10-25. Koseoglu, M. A. (2016) "Growth and Structure of Authorship and Co-authorship Network in the Strategic Management Realm: Evidence from the Strategic Management Journal", Business Research Quarterly, 19(3), ss. 153-170. Leydesdorff, L. (2007) "Betweenness Centrality as an Indicator of the Interdisciplinarity of Scientific Journals", Journal of the American Society for Information Science and Technology, 58(9), ss. 1303-1319. Liu, X., Bollen, J., Nelson, M. L. ve Van de Sompel, H. (2005) "Co-authorship Networks in the Digital Library Research Community", Information Processing and Management, 41(6), ss. 1462-1480. Ma, R. ve Yan, E. (2016) "Uncovering Inter-specialty Knowledge Communication Using Author Citation Networks", Scientometrics, 109(2), ss. 839-854. Melin, G. ve Persson, O. (1996) "Studying Research Collaboration Using Coauthorships", Scientometrics, 36(6), ss. 363-377. Nerur, S. P., Rasheed, A. A. ve Natarajan, V. (2008) "The Intellectual Structure of the Strategic Management Field: An Author Co-citation Analysis", Strategic Management Journal, 29, ss. 319-336. Nerur, S., Rasheed, A. A. ve Pandey, A. (2016) "Citation Footprints on the Sands of Time: An Analysis of Idea Migrations in Strategic Management", Strategic Management Journal, 37, ss. 1065-1084. Ortiz-Arroyo, D. (2010) Discovering Sets of Key Players in Social Networks. A.Abraham, A. Hassanien, & V. Snasel içinde, Computational Social Network Analysis: Trends, Tools and Research (s. 27-47). New York: Springer. Pannucci, C. J. ve Wilkins, E. G. (2010) "Identifying and Avoiding Bias in Research", Plastic and Reconstructive Surgery, 126(2), ss. 619-625. Pilkington, A. ve Meredith, J. (2009) "The Evolution of the Intellectual Structure of Operations Management—1980–2006: A Citation/Co-citation Analysis", Journal of Operations Management, 27(3), ss. 185-202. Ponomariov, B. ve Boardman, C. (2016) "What is Co-authorship? ", Scientometrics, 109(3), ss. 1939-1963. Prell, C. (2013) Social Network Analysis: History, Theory and Methodology. London: Sage. Pritchard, A. (1969) "Statistical Bibliography or Bibliometrics? ", Journal of Documentation, 25(4), ss. 348-349. Ramos-Rodríguez, A.-R. ve Ruíz-Navarro, J. (2004) "Changes in the Intellectual Structure of Strategic Management Research: A Bibliometric Study of the Strategic Management Journal, 1980-2000", Strategic Management Journal, 25, ss. 981-1004. Rice, R. E., Borgman, C. L. ve Reeves, R. (1988) "Citation Networks of Communication Journals, 1977–1985: Cliques and Positions, Citations Made and Citations Received", Human Communication Research, 15(2), ss. 256–283. Robins, R. W. ve Craik, K. H. (1993) "Is There a Citation Bias in the Judgment and Decision Literature? ", Organizational Behavior and Human Decision Processes, 54(2), ss. 225-244. Selenium Kütüphanesi, https://www.seleniumhq.org Sharplin, A. D. ve Mabry, R. H. (1985) "The Relative Importance of Journals Used in Management Research: An Alternative Ranking", Human Relations, 38(2), ss. 139-149. Shibata, N., Kajikawa Y., Takeda, Y. ve Matsushima, K. (2008) "Detecting Emerging Research Fronts Based on Topological Measures in Citation Networks of Scientific Publications", Technovation, 28(11), ss. 758-775. Small, H. (1973) "Co-citation in the Scientific Literature: A New Measure of the Relationship Between Two Documents", Journal of the American Society for Information Science, 24(4), ss. 265-269. So, C. Y. K. (1988) "Citation Patterns of Core Communication Journals: An Assessment of the Developmental Status of Communication", Human Communication Research, 15(2), ss. 236–255. Tang, K.-Y., Wang, C.-Y., Chang, H.-Y., Chen, S., Lo, H.-C. ve Tsai, C.-C. (2016) "The Intellectual Structure of Metacognitive Scaffolding in Science Education: A Co-citation Network Analysis" International Journal of Science Mathematics Education, 14, ss. 249-262. Üsdiken, B. ve Erden, Z. (2002) "1990'lı Yıllarda Türkiye'de Yönetim Alanı: Disiplinin Yapısı ve Yaklaşımlar", Yönetim Araştırmaları Dergisi, 2(1), ss. 91-113. Üsdiken, B. ve Pasadeos, Y. (1995) "Organizational Analysis in North America and Europe: A Comparison of Co-citation Networks", Organization Studies, 16(3), ss. 503-526. Vogel, R. ve Güttel, W. H. (2013) "The Dynamic Capability View in Strategic Management: A Bibliometric Review", International Journal of Management Reviews, 15(4), ss. 426-446. White, H. D. ve Griffith, B. C. (1981) "Author Cocitation: A Literature Measure of Intellectual Structure", Journal of the American Society for Information Science, 32(3), ss. 163-171. Zervas, P. Tsitmidelli, A., Sampson, D. G. ve Chen, N.-S. K. (2014) "Studying Research Collaboration Patterns via Co-authorship Analysis in the Field of TeL: The Case of Educational Technology & Society Journal", Educational Technology & Society, 17(4), ss. 1-16. Zupic, I. ve Čater, T. (2015) "Bibliometric Methods in Management and Organization", Organizational Research Methods, 18(3), ss. 429-472. ISNAD Baskıcı, Çiğdem . "Stratejik Yönetim Alanındaki Atıf İlişkilerinin Ağ Analizi ile Değerlendirilmesi". Atatürk Üniversitesi İktisadi ve İdari Bilimler Dergisi 33 / 1 (February 2019): 51-68.